Kristen Martin is a Supervisor, Customer Care at Comcast. Kristen Martin, Care Supervisor, in Comcast Western New England’s Enfield, CT call center. 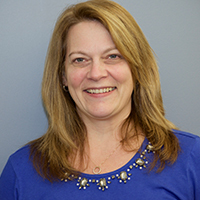 Kristen began her Comcast career in 1988 as a Customer Service Representative with Continental Cablevision. She has held roles in Business Operations, Sales, Collections, Accounts Payable, and Supply Chain Operations. She has a strong support background in Analytics and Reporting, Business Operations, and Process Improvement. She has taken a lead in the development, training, and launch of divisional applications that have enhanced efficiencies for numerous departments. Now entering her 30th year, she has a demonstrated history of exceptional performance in multiple aspects of the industry. In her current role, she ensures that every customer interaction results in an Exceptional Customer Experience. She is a passionate leader that is dedicated to organizational excellence and her team’s professional development. Kristen was instrumental in establishing Comcast Western New England’s Young Professionals Network, the region’s first Employee Resource Group. She has been actively involved in Comcast Cares Day since 2001, taking on the role of site leader for the past four years. She is a graduate of Comcast’s Linked to Leadership development program for high potential employees and is currently continuing her education though Champlain College’s Tru-Ed program for Business Management. Kristen has been an active WICT New England member since 2014, and has participated in WICT’s mentorship program as both a protege and a mentor. She was awarded WICT New England’s Woman to Watch Award in 2016.